It seems these days that everyone wants to be an entrepreneur. A CEO. A business owner. A girl boss (though I loathe that term). Basically, everyone wants to be in charge — in charge of her own life, her own business, her own destiny. But, in reality, being an entrepreneur is not necessarily for everyone. More on that in a bit. 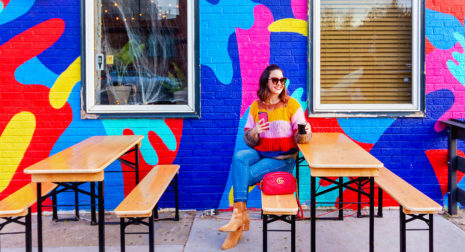 Assuming, though, you are in fact cut out for entrepreneurship, how do you know when it’s time to turn your side hustle into a full-time business? 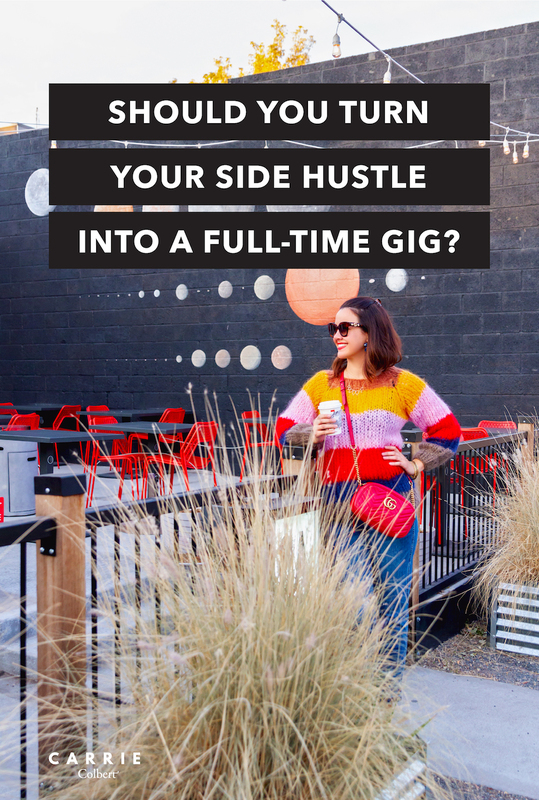 In the meantime, how do you juggle both a side hustle and a full-time job? When you are ready to make the leap, what steps do you need to take to turn your side hustle into a full-time business? First, an observation about today’s economic environment: there are more ways than ever to make money! It’s mind-boggling how people have found ways to monetize the simplest of ideas. For instance, I was recently chatting with a food blogger friend, and I was blown away at how much revenue she was going to bring in this year. Astounded, inspired, proud – all of those adjectives apply! Indeed, there are more opportunities than ever to follow your passion and make it a profession. The younger generation in today’s workforce clearly recognizes that. In fact, a 2017 study found that 50 percent of millennials have a side hustle! That means one in every two millennials is out there chasing a passion project and / or trying to bring in more cash. Most seem to have the intent to leave the corporate world eventually. So, how do you know when the timing is right? Here are some of the top considerations for knowing when it’s time to quit your full-time job. 1. You are financially prepared. Going out on your own is risky business. Even with the best laid plans, you likely won’t be making money from the onset. In fact, you realistically might not be making money for several years! Do I have enough saved up to get me through this start up period? Note that only you can determine exactly what “enough” means in your situation. However, I would start with considering a one-year time frame. Am I willing to curtail my personal expenses on a day-to-day basis during this start-up period? Leading a start up requires some sacrifice and delayed gratification at times. Are you up for that? Trust me – going from a cushy corporate career to the scrappy startup scenario can be a harsh reality! Gone are the days of regular paychecks, medical benefits, bonuses, and paid time off. Welcome to the world of hustling for every dollar and basically never taking a day off. The onus is on you to prepare yourself as much as possible in advance financially to navigate this transition. 2. You are motivated and disciplined. Many people think it’s time to pursue their dreams simply because they can’t stop thinking about it. And sure that’s a sign it’s time to move on from your full-time career. When you are thinking of your passion project more than you are thinking about your full-time job, you are doing a disservice to both. But beyond having that dream, be sure you also have the discipline required as an entrepreneur. Daydreaming about big ideas is not going to pay the bills. You must also have the discipline to do the work. No one is going to be hounding you day-to-day. No one is going to be giving you deadlines. Make sure you have the internal fortitude to do the work day in and day out to make your dream a reality. 3. You know your numbers. It’s no secret that I’m a huge proponent of knowing your numbers. And before you leave the relative security of a full-time job, you better know your numbers inside and out! What is your top line revenue? What are your expenses? How profitable were you last year? What does your balance sheet look like? Have you developed a business plan? What is your growth trajectory and strategy? How are you going to get from where you are today to where you want to be? Are you going to need to bring in outside capital to grow your business, or are you going to be able to self-fund your business? Even if you are looking to go into a creative industry, you still must know your numbers! At the end of the day, you’re in this to make money and ultimately support your family and make the world a better place. So, let’s make sure you can achieve that. 4. You believe in yourself. Making the leap to self-employment requires you to believe in yourself (and your ideas) wholeheartedly! Do you believe in your gut that you can make this work? Do you know in your soul this is what you were made to do? Good! Because you now have to be your own advocate, cheerleader, saleswoman, and more. 5. Both your full-time job and side hustle are suffering. This might ultimately be the straw that breaks the proverbial camel’s back. And when it happens, you’ll know it. It’s simply impossible to give 100 percent effort to both. Eventually, something has to give. If you are no longer able to give your full-time job the time and effort and focus it deserves, you are cheating the company. And that’s not okay for those of us who wish to operate in a moral and ethical manner. And if you are having to turn down opportunities for your side gig, you are doing a disservice to your side hustle. You’ll never truly know what it can be until you give it your all! If you are at this point, and you’ve also considered signs one through four, perhaps it’s time for you to take that leap! Now, having said all of this, the entrepreneur life is not for everyone. I jokingly tell people that I now work more hours and make less money than ever before. There’s some truth to that! Sure, I’m building long term net worth, but the day to day struggle is real. For one accustomed to a steady robust paycheck, health insurance and other benefits, and paid time off, the reality of working for yourself can be difficult. Here are some considerations when deciding whether or not you are cut out to be an entrepreneur. 1. Starting your own business requires discipline. Being your own boss isn’t all fun and games. Sure, having a flexible schedule sounds enticing. But are you disciplined enough to set your own work hours, adhere to deadlines, and get stuff done? At the end of the day, when you’re your own boss, results matter more than anything! The hours may be flexible, but you have to get the work done! You are ultimately accountable and responsible for everything! 2. Starting your own business requires capital. As I mentioned in sign number one, the reality is that startup businesses usually operate at a loss initially. Though there is no hard and fast rule, as each business is different, you should count on perhaps two years before you start making a profit. And even when you start to make money, you may want to reinvest it into the business in order to grow the business even more. So, before starting your own business, consider whether you have enough savings or enough access to capital to cover (a) your living and personal expenses, and (b) your business operating expenses including salaries for a couple years. 3. Starting your own business requires you be flexible and adaptable. As much as I advocate planning, there is no set road map for entrepreneurs. The reality is that you are going to hit bumps in the road… personal challenges, market changes, economic swings, and so on and so forth. You continually have to correct and change course. It’s just the nature of the beast. Let me reiterate again: the entrepreneurial life is not for everyone! And that’s okay. But if you are up for the challenge, starting your own business can be the most exhilarating experience of your professional life. Before you take the leap, though, take into account these five considerations. Plan, plan, plan, and then go make it happen! Agree with every.single.word Carrie! I’m a newbie entrepreneur who jumped from oil/gas to starting my own company and that 1 year timeline seems too small …now my brother wants to make a jump and I’m sending him this link haha…thanks for the great post! Hope you had a great thanksgiving! Krishna – that’s amazing! I’d love to hear more about your business. I was in oil and gas for almost twenty years. Let’s chat more! Best wishes to you and to your brother.